"No tears are being shed over him"
Many Middle East press commentators view what they dub the "fall" of US defence secretary Donald Rumsfeld as symbolic of the perceived failure of US policy in Iraq as a whole. Several predict that his resignation will be the first of many members of the Bush administration. Yes, the Bush administration is beginning to fall... 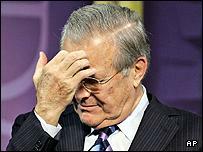 The first sign of this fall is the removal of Rumsfeld, the wolf who brought defeat to America. The fall of Rumsfeld heralds the fall of the agenda of the Bush administration in Iraq. Rumsfeld is gone and will not come back. Everybody will remember that he is the man who managed to push his country to the verge of catastrophe. Rumsfeld's is not the only head that will roll, as the objective of Bush's Roman Empire is crumbling. An emperor, who used democracy as a slogan to seize oilfields, should not be allowed any consolation because of the chaos and violence he created everywhere. Rumsfeld was just the scapegoat for a defeated administration and holding him responsible alone for this defeat implies an unusual naivety and even a great injustice and avoidance of accountability. He was a member of a whole team followed by an army of advisers and implementing a policy drawn up by a President who many agree is stupid and short-sighted. Surely, Rumsfeld should take the blame for most of the US debacle in Iraq. After a landslide military victory, the series of mistakes he made there have shown him to be not only ignorant of the realities in Iraq and the region, but clearly inexperienced in the international political game. The question is why did he not - or was he not made to - resign much earlier? In every one of the 13 visits Rumsfeld paid to Baghdad, he was been given a taste of the final defeat he and his party were going to suffer in Congress. Iraqis are far from satisfied with what has befallen Rumsfeld. They are looking forward to seeing other heads roll, including those of his US and Iraqi cohorts, which are bound to be chopped off either by the Democrats in Washington, or at the hands of Iraqis determined not let the occupier and his lackeys get away with the catastrophic damage they have done in this country. Rumsfeld is the one who has to be blamed most for the fiasco of US policy in Iraq ... The series of mistakes he made stem from gross ignorance about Iraq and the region ... His removal is the declaration of defeat in America and Iraq. Donald Rumsfeld has fallen and no tears are being shed over him. This was supposed to happen. It was delayed for a long time ... The downfall of Rumsfeld means nothing without a change in the policies of the Bush administration; but will they change? Defence secretary Donald Rumsfeld was the first victim, and it is almost certain that the chain of resignations will continue until the remaining members of the team that supported Rumsfeld's military policy in Iraq are gone... Rumsfeld ... was one of the main architects and supporters of the strategy of what is known in the United States as "the war on terror". Therefore, the changes will affect this aspect... It is also hoped that the changes will affect the important issue in the region. Rumsfeld was the one to whom the expression "old Europe" has stuck for ever. He was the one who did not stop his tongue from committing mistakes many times regarding Islam, the Arabs and other people. That is why I do not think that his farewell party will be overwhelmed by bouquets of flowers from Iraq, Afghanistan or even Paris. Rumsfeld was not a scapegoat, but he was a victim of the war on Afghanistan then on Iraq. Because of the great mistakes committed under the aegis of fighting terrorism, it was necessary to find someone to pay the price. So, Rumsfeld has made a down-payment, but the bill has not yet been completely paid off. Bush promptly accepted that Americans were unhappy with his policies in Iraq when he swiftly sacked his defence secretary Rumsfeld, one of the architects of this war. Of course, many Arabs feel jubilation. For them this is a smack in the face for Bush. As far as they are concerned: 'Iraq defeated Bush'.